The Burmese python (Python molurus bivittatus), native to southeast Asia, and is one of the largest snakes species in the world reaching lengths of 7 meters and a mass exceeding 100 kg. The development of the Burmese python as a research model evolved from a study on the digestive responses of the infrequently feeding snake, the sidewinder rattlesnake (Crotalus cerastes). In a study coauthored by Eric Stein, Jared Diamond, and myself we discovered that sidewinders dramatically upregulate intestinal performance after feeding and then downregulate intestinal function and morphology once digestion was completed. This response was matched with an unprecedented increase (8-fold) in metabolic rate during digestion. While these findings were exciting and sparked ideas for new studies, sidewinders can only be obtained from the wild, and as rattlesnakes they are venomous. Given the efforts needed to acquire more sidewinders for research and the management issues and risks of housing and working with a venomous snake, I searched for an alternative snake to study. I compared postfeeding responses of several species of snakes and found the Burmese python, which also feeds infrequently in the wild, to exhibit similar magnitudes of physiological responses as the sidewinders. 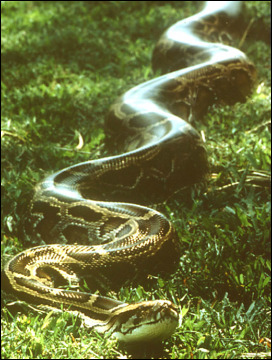 Additionally, Burmese pythons are not venomous, generally very docile, and are produced commercially for the pet trade. They are easy to maintain, can be feed once every week or two, and like rodents can be housed in commercial rack systems. Since 1993, my studies of the Burmese pythons have explored a variety of physiological responses to long-term fasting and feeding. For the python, fasting triggers an integrative downregulation of tissue performance. We have proposed that this response serves to reduce their metabolism, thereby decreasing energy expenditure during their long bouts between meals. 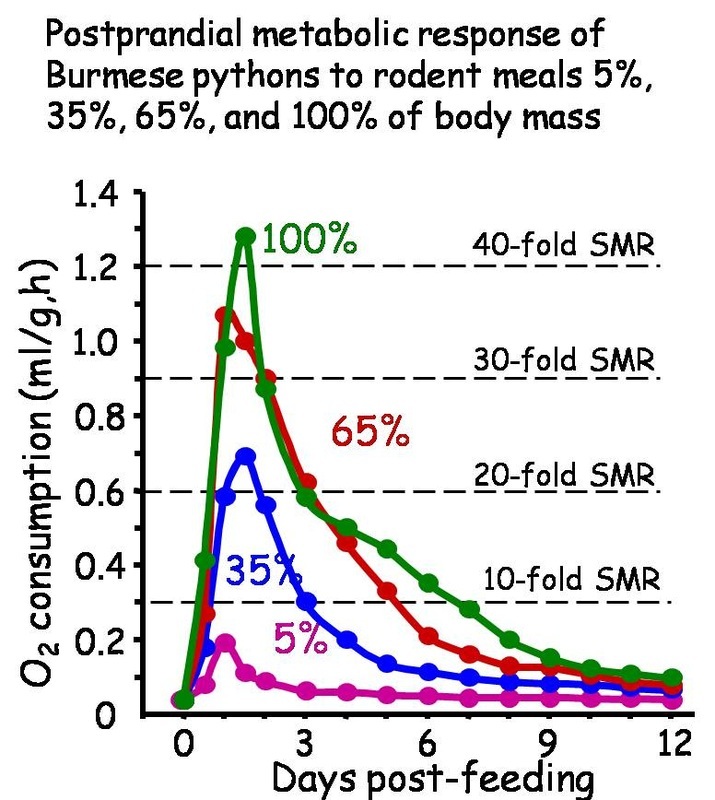 Support for this hypothesis is that the standard metabolic rates of the Burmese pythons (as well as other snakes that feed infrequently) are lower than those snakes that feed frequently and don’t widely regulate intestinal performance with feeding and fasting. Given that during fasting physiological performance in pythons is downregulated, performance is then rapidly upregulated with feeding. The magnitude by which the python regulates performance with feeding is much greater than the changes documented with feeding for more traditional animal research models (mice, rats, rabbits). Our work and that of our collaborators have examined the following integrative responses of the python to feeding and fasting. Metabolic performance: The large postprandial increase in metabolic rate for the Burmese python was first observed by Francis Benedict in the early 1900's. We likewise found the python to exhibit the largest relative scope in postprandial metabolism of any studied organism. 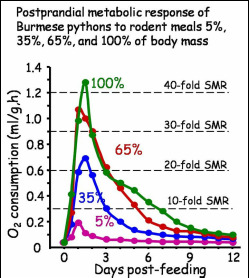 In fact, the magnitude of their postprandial metabolism was found to increase with meal size, such that when digesting meals equaling their body mass, they experience a 44-fold increase in metabolic rate. The only known prior example of such of an increase in metabolism is that experienced by race horses during a full gallop. Whereas high rates of metabolism experienced during exercise are short-lived for most organisms, pythons can maintain elevated levels of metabolism for days during digestion. We have explored the possible mechanisms for fueling such high levels of metabolism and have found the python to experience tremendous postfeeding increases (> 150-fold) in plasma concentration of triglycerides (> 1500 mg/dL). Originating from body fat stores and the meal, these circulating lipids are a valuable source of energy for fueling meal digestion. Gastrointestinal form and function: Feeding triggers the quiescent stomach and small intestine to rapidly upregulate performance. Within hours, the stomach begins to produce hydrochloric acid resulting in a drop of gastric pH from 7.5 to 2. Gastric pH is maintained around 1.5 for the duration (as much as 10 days) of gastric breakdown. Simultaneously, the small intestine responds both morphologically and functionally. Within 24 hours after feeding the small intestine doubles in mass, as intestinal enterocytes increase in volume by 50%. Functional surface area is increased with the lengthening of the villi and the unprecedented 5-fold increase in the length of the microvilli. Matched with these trophic responses is the rapid upregulation of nutrient transport as amino acid and glucose transport rates increase by 5 to 10-fold. These integrative responses generate a 10 to 20-fold increase in total small intestinal performance to absorb nutrients. Given that mammal models can regulate intestinal performance over a 2-fold range, the python is an unmatched model for studying the underlying mechanisms responsible for trophic and functional responses of the small intestine. Figures illustrating the postfeeding changes in gastric pH, intestinal uptake of L-proline, and intestinal microvillus length. Pythons exhibit an unprecedented postfeeding response in gastrointestinal function. Cardiovascular performance: The large demand for digestive performance in the python is supported by the postprandial upregulation in their cardiovascular performance. During digestion, pythons experience a 4 to 5-fold increase in cardiac output, whereas during exercise cardiac output in these snakes increases by only 3 to 4-fold. As demand on the gut is increased with larger meals, pythons respond by further increasing cardiac output until it reaches a plateau with meals larger than 35% of their body mass. As expected, blood flow to the gut increases for the python, superior mesenteric flow and hepatic portal flow increase as much as 11- and 16-fold, respectively, which is the large relative increase yet documented for the postprandial gut. For the python, we have documented a 40% increase in heart mass (physiological hypertrophy) after feeding, as well as increases in cardiac metabolism and metabolic machinery. The advantage of the python model for studies in cardiac performance is that the metabolic demand that generates the increase in performance is digestion, which is non-fatiguing. In contrast, studies that use exercise to elevate cardiac performance are hindered by the physiological limitations of fatigue-prone skeletal muscles. Therefore, we can maintain elevated levels of cardiac performance (without fatiguing) in these snakes and demonstrate that their cardiac performance can exceed that during exercise, and thus is not a limiting factor in determining maximum rates of metabolism experienced during exercise. Images illustrating the measuring of blood flow from fasted, crawling, and digesting Burmese pythons and the postfeeding increases in heart mass and cardiac output. Signals and mechanisms that underlie the modulation of tissue form and function: The python’s unprecedented capacity to rapidly alter tissue structure and function with the onset and completion of digestion provide unique opportunities to decipher the signaling pathways and molecular mechanisms responsible for tissue hypertrophy and atrophy and the up- and downregulation of tissue performance. Employing techniques of histology, immunohistochemistry, electrophoresis, RIA, metabolomics, proteomics, and transcriptomics, we are dissecting the signals and molecular steps that result in the modulation of cellular form and function. Our gene expression studies have identified thousands of genes of the python’s intestine that are differentially expressed with feeding, many of which can be linked to specific responses (metabolism, nutrient uptake, hydrolase activity, hypertrophy, and microvillus growth) of the python intestine. The ability to construct the molecular pathways of intestinal response is greatly enhanced by our annotation and publication of the Burmese python genome (Castoe et al 2013), the first snake to have it genome constructed. (A) Volcano diagram illustrating the number of small intestinal genes whose expression are downregulated (negative fold change) and upregulated (positive fold change). Those in red are identified as being significantly regulated. (B) The number of unique and common genes whose expression are upregulated for the Burmese python heart, kidney, small intestine, and liver with feeding. (C). 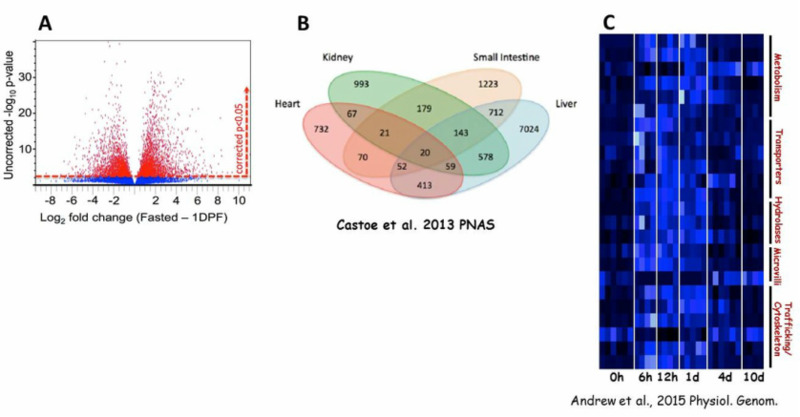 Heat map illustrating the differential expression of small intestinal genes with feeding that are involved in the remodeling of intestinal form and function for the Burmese python. Potential for translational application for diseases: We have already identified two translational avenues of the Burmese python for human diseases; heart disease and diabetes. Active factors in the blood of digesting Burmese pythons stimulate the growth of neonatal rat cardiomyocytes, whereas the blood of fasting snakes has no effect. Likewise, factor in the blood of digesting snakes induces the growth and increase insulin production of human pancreatic beta cell. The postprandial blood of these snakes will also stimulate human beta cells to become more resistant to the toxic effects of elevated lipids and cytokines, thus reprograming a protective mechanism to the cells. (A) Administration of serum from fasted Burmese pythons had no effect on the size of neonatal rat cardiomyocytes, whereas serum from a digesting snake stimulated a 70% in the size of the rat's cardiomyocytes. (B). Plasma from a digesting Burmese pythons (2 days postfeeding) induced a significant increase in the size of human pancreatic beta cells. (C) Human pancreatic beta cell when exposed to plasma from a digesting pythons experience a 60% increase in insulin production.